Home ⌂→Sedgefield Area News and Articles→Articles from 2018→Choir member ‘lookalikes’ at Sedgefield Tree Festival? The choir at Sedgefield’s ancient parish church will double in size during the Christmas Tree Festival at St Edmund’s – thanks to the efforts of current choristers. 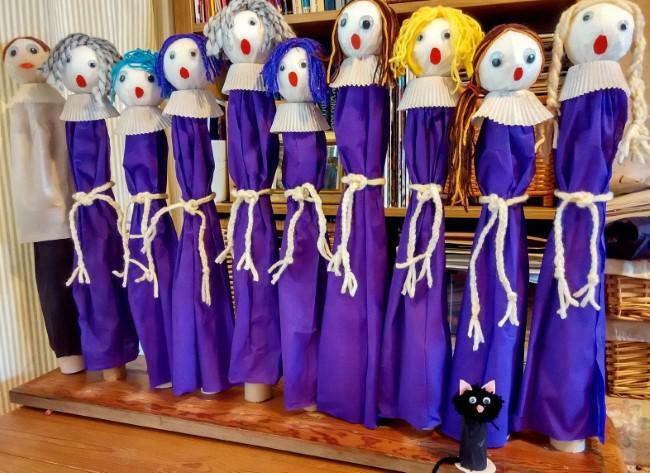 They have been hard at work crafting miniature choral members in striking purple and white robes and one gentleman in a cassock and surplice to illustrate their ‘The Holly and the Ivy’ display – and which even features one member’s pet black cat. Several people who have had a sneak preview of the figures comment on how much they look like current and recently-departed members of the choir. The festival will have 47 displays on the theme of ‘A Carol for Christmas’. It will be opened at 10am on Saturday, December 1, by television personality Pam Royle and will be open to visitors until Thursday. December 6. Admission is free but donations will be welcome. All profits will be shared between the Great North Air Ambulance and St Edmund’s Church Roof appeal.